Are looking for a Costa Maya beach resort away from the crowds. Want to eat some excellent food on a quiet beach. Enjoy some cold beers, sodas, smoothies or amazing cocktails. Could use a professional relaxing massage while listening to the waves and looking at the ocean. But you are NOT looking for an all-inclusive Costa Maya beach resort. Maya Luna welcomes cruisers ! You want only to pay for what you eat and drink…at very reasonable prices! Costa Maya beach resort Maya Luna is THE PLACE FOR YOU to spend your day when your ship docks at Costa Maya. 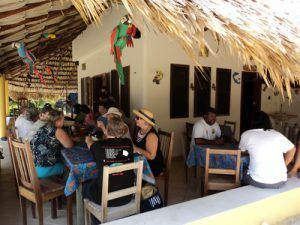 Costa Maya beach resort Maya Luna is known for its excellent bar and kitchen. Our barkeeper will gladly prepare you one of our Caribbean cocktails like Margaritas, Piña Coladas or a Tequila Sunrise.. Or try a Mojito, the most famous drink of Cuba. Guests are raving about our freshly prepared guacamole. Rumor goes that you can’t leave without trying our stuffed pineapple; a “Mexican/Euro/Indonesian Extravaganza” as it is described in the guide of Lonely Planet. We always use 100% purified water to clean all vegetables. All ice cubes are also made of 100% purified water. Maya Luna guests can use our shaded patio, our wooden beach tables, beach chairs & hammock chairs in our beach garden (all with ocean view). You can use our public rest rooms and shower. We will ask you to be modest in the use of energy and water, because all our systems are self-supporting (rainwater for the bathrooms and solar energy for power). Enjoy the sun in one of our hammocks or beach chairs or sit under the shady sea grape, with your feet in the white sand, watching the waves break on the reef. Take a walk in our beautiful garden with lots of flowers and fruit trees, like bougainvillea, sea grape, papaya, noni, banana and of course coconut palms. Check out our library with interesting books to read about i.e. the Maya culture, birds & animals in the area, famous Mexican painters etc. Rent a kayak and/or snorkel equipment and enjoy our beautiful reef, just 400 meters in front of Costa Maya beach resort Maya Luna. The water in front of Maya Luna is quite shallow and the reef holds away the larger waves. 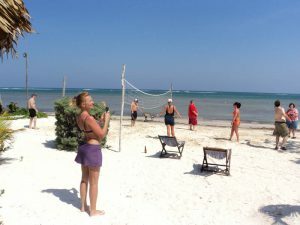 On our beach you can play volleyball. We are located only 6 miles south of the cruise ship port. There are 2 possibilities to get from the cruise ship port to Maya Luna by taxi or rent a golf cart. Take one of the YELLOW TAXIS outside the cruise ship port. Leaving the port, the photo on the left shows what you see. You have to walk 2 minutes to the blue tower. That is the official taxi place of the yellow cabs. You can either take a cab or rent a golf cart. The “official” transportation booth INSIDE the port can be very misleading. They will try to convince you and insist that they (the WHITE taxis) are the only transportation available. Not true. You just keep walking to the gate and leave the port. FAQ: Why is it better to take a yellow cab? ANSWER: The white taxis can get you to Maya Luna, but DONT Have the permission to pick you up again at our place and bring you back to the port. To confirm your reservation at Maya Luna beach, we will send you an invoice with PayPal. This downpayment is NOT a fee to stay on our beach, but goes towards your restaurant bill. Example: your bill is 40 USD. You paid us 25 USD by paypal to secure the reservation. The remainder is 15 USD to be paid. Please let us know on forehand how many people of your company are interested in a very relaxing massage so we can prepare as good as possible. We accept only a MAXIMUM AMOUNT of guests at our Costa Maya beach resort. So don’t wait too long to make a reservation! We speak fluent english, spanish, french and dutch, so there wont be any communication problems. We can give you all prices in USD if needed. Paying with credit card is possible. We accept Visa and Mastercard.